Unless you’re new to guitar, you’ve probably heard about the famous Big Muff Pi pedal. It’s a fuzz style distortion pedal and is used on so many classic tracks. I’ve always wanted a Big Muff Pi but hated how big and clunky the original was. The current trend at the moment is to create pedals in a smaller form so they don’t take up as much real estate on your pedalboard. This review looks at the Nano Big Muff Pi which is essentially the same pedal in a smaller size. You can use this review to decide whether you want to get the original pedal or the smaller Nano pedal. Same effect – different size. The Nano Big Muff Pi is a fuzz distortion pedal. 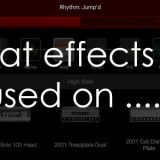 Fuzz pedals have a distinctive sound and purpose and the video later on will give you a good idea on what to expect with a good quality fuzz pedal. The main feature worth mentioning here is the small size compared to the original Big Muff Pi. It really is a fraction of the size and for the same sound it’s hard to now choose the larger version over the Nano. Check out the video and you can see how ridiculous the difference in size is between the original and the Nano. 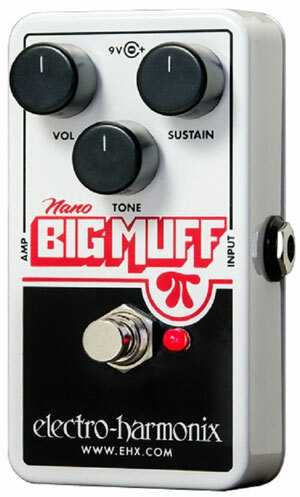 The Nano Big Muff uses True Bypass and operates using a 9V battery or DC power supply. This is great news as a lot of recent tiny pedals don’t even have the option for a battery. Being able to choose whether you want to use an external power supply or a battery may not sound important, but it can be incredibly frustrating when you have to rely on one or the other and you don’t have the option. EHX had so much success with the original Big Muff pedal that now you can find quite a lot of their pedals based on the original such as Deluxe Big Muff Pi, Big Muff Pi with Tone Wicker, Double Muff, English Muff’n, Germanium 4 Big Muff Pi, Little Big Muff Pi, Metal Muff, Micro Metal Muff, Muff Overdrive, Pocket Metal Muff as well as a range for bass guitar. Seriously that’s a long list based off one pedal! Obviously, EHX had have a long run of cashing in on the success of the original. If you needed any proof that the Big Muff was a success, it’s plenty of proof when the company creates a range like that. Now the difference with the Nano is that it isn’t trying to change the original Muff sound or enhancing it in any way. The goal with the Nano is to provide the same sound without hogging up floor space. So if you want the classic sound without the comically massive size of the original, the Nano is a great option. This is a very straight forward pedal compared to something like the EHX-Tortion which focuses on flexibility. Three controls just like your standard distortion pedal. This means it has one main sound with some flexibility to control your tone and sustain. As you can see from the short list of features above, there really isn’t much involved with the Nano Big Muff Pi. It’s a simple fuzz pedal focused on giving you the iconic Muff sound. It really was as simple as adjusting the sustain to my liking and trying different tone settings for what feel I was after. I want to mention that I love the EHX-Tortion and feel it is the best distortion/overdrive pedal I have ever used. The main reason I say that is because of the massive range of tones it produces. But that does come at a cost – the EHX Tortion has 8 knobs to play around with – that’s a big increase in complexity. The difference with the Nano is that it has one main tone and you simply adjust the three knobs to your liking. It’s simple and it does a good job. If you’re looking for a simple pedal, it doesn’t get simpler than the Nano Big Muff Pi. The simplicity does mean you give up flexibility in tone, but you do get the iconic Muff sound. So that’s the trade-off you have to consider when looking at a simple pedal like the Nano Big Muff. If you’re unfamiliar with fuzz distortion, you may not get what all the fuss is about. The thing is fuzz pedals generally don’t sound that interesting in videos like the one above, but they sound and feel amazing when you use them in person. Cranking up an amp and playing some thick chords or a lead with high sustain on a fuzz pedal feels fantastic. The rich sound produced can only be appreciated coming out of an amp. 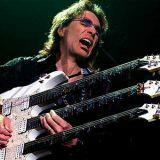 That’s why I believe the Big Muff Pi has been so successful over the last four decades – because it feels great to play as a guitarist. A nice smooth distortion might sound better (generally speaking) on a recording, but when it comes to live usage, a fuzz pedal is inspiring. I didn’t own the original Big Muff before trying the Nano so I unfortunately couldn’t do a direct comparison, but from what I’ve heard from other guitarists, the two are essentially identical in tone. Some purists might complain that it isn’t the same as the original 1977 pedal, but is that really important? If you want the iconic sound, this is as good as it gets. You can see that while the Big Muff has a certain sound, it has been used by various bands and guitarists in very different ways. The Smashing Pumpkins album really showcases the pedal’s sound while the Muff is almost unrecognizable in many of the Pink Floyd tracks it is used. So the point here is that while it does have a very distinctive sound, it is still very flexible. I love the current trend of producing tiny pedals as it means you can fit more on your pedalboard. At the same time I always feel I’m going to roll my ankle on one every time I stomp on them. Fortunately the Nano isn’t that small. It’s small but not so tiny that you could flip it over when you stand on it. Like all of EHX’s more recent pedals, the construction of the pedals is fantastic. Incredibly durable and it feels rugged. You’re not going to stress about breaking knobs like other pedals. Based on the experience I’ve had with their other pedals such as the B9 Organ Machine or the EXH Tortion, I’m confident that the Nano Big Muff Pi will last a long time. The Nano Big Muff Pi didn’t stun me like the EHX Tortion did – but that’s okay. This pedal has one purpose: to give you the classic Big Muff sound without hogging your floor space and it does a great job of it. The Nano doesn’t have the flexibility that the EHX Tortion offers, but that doesn’t matter. If you want flexibility, there are other pedals out there. If you want the iconic fuzz sound – this is the pedal to go for. Check out the current price of the Nano Big Muff Pi here. I can’t think of anything I didn’t like about this pedal. It serves a specific purpose so it’s not fair to say something like it isn’t flexible in tones. It does a great job at what it sets out to do and whether this is the right pedal for you or not is something you need to consider. If you looked at the list of songs/bands/guitarists above that have used the Big Muff and were curious, then that’s a sign the Big Muff is right for you. On the other hand if none of those bands or guitarists interested you, it might be that fuzz distortion isn’t something you’re looking for. Obviously if you like the fuzzy tones of Hendrix or similar guitarists, then you will definitely have a use for the Nano Big Muff. If you prefer a more refined or controlled distortion tone, the Nano Big Muff (or any fuzz pedal) may not be for you. I personally prefer smooth and creamy sounding distortion so that’s why I prefer the EHX Tortion over the Big Muff. But even I find it useful when I want a more raw sound. Have a listen through the songs you like to play and you’ll quickly figure out if the Nano Big Muff is right for you or not. 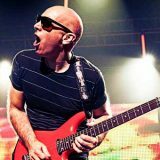 Listen to how it has been used by other guitarists. Listen to the Smashing Pumpkins album then listen to the solo in Comfortably Numb and you will hear two completely different tones from the same pedal. Try to adjust your settings to match those songs as closely as possible. Then check out how other guitarists use the pedal. Check out how Korn use it on their down-tuned 7 strings then check out how it’s used on bass to create a grinding sound. The pedal can be flexible depending on how you use it so start off with the list of guitarists and songs we mention above and try to mimic those tones. Obviously the original Big Muff Pi is a direct alternative to the Nano. It produces the same tone but takes up more space. Of course, you could look at other options such as the Deluxe Big Muff or any of the other Muff inspired pedals. If you’re after a fuzz pedal, check out my Ultimate Guide on Fuzz Pedals for more alternatives. See information on pricing, availability and other details here on Amazon.